Pest Control is an important step for good agriculture production and we have already discussed about mechanical sprayer in this blog.To do our own pest and weed control, we don’t need any exotic equipment, you just need an idea and some knowledge of science. Mansukhbhai Jagani of Gujarat (India) has both and he invented bicycle sprayer which is topic of our today’s discussion. As we have discussed in my last post, that in mechanical sprayer farmers need to pump manually, as a result, spraying remains difficult task with these sprayers. Today, we will discuss bicycle sprayer which is much easier to operate than its predecessor as it is powered by bicycle. Spraying of pesticides and other chemicals in the far is a tedious and laborious task. The conventional knapsack sprayers available in the market require manual labor to operate, and nowadays labor is difficult to find due to movement of farm laborers toward cities. The small farmers cannot afford to buy the power operated sprayer or tractor-mounted sprayers available in the market, as these are very costly and are of not much use to small farmers due to small land holdings. 1.First is to transform rotational motion into reciprocating motion. 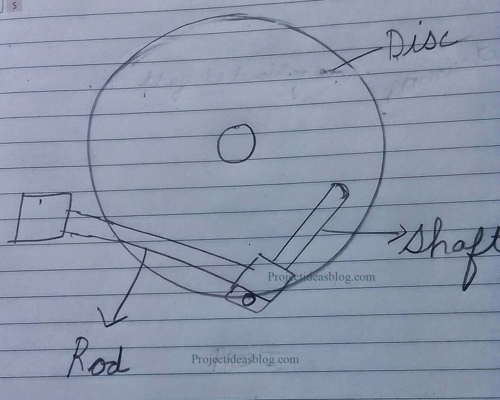 In other words, when wheels move in circular motion it should push and pull piston in to and fro motion. To build this system, we need two sprockets (one small and one large), chain, and connectors. We will connect small sprocket (we can get it from any old bicycle or from any store) to the large sprocket using cycle chain. When we move bicycle forward, it moves both first sprocket, which eventually moves second sprocket at the top and this sprocket pushes the piston in to and fro motion as shown in video. 2.This reciprocating motion than pushes piston moves forward and backward in a repetitive cycle. For better understanding of inner mechanism of reservoir you need to understand basics of spray pump and how it moves liquid from reservoir to top. To pump out pesticide we should know that pesticide must always move outside from reservoir. Fluid must move upward only, in other words, it must be unidirectional. This can be achieved only by one way valve. The most important part for any pumping mechanism is one way valve and in our experiment too, we will use valve which allow fuel to enter but stop it when it tries to exit.